Thoughtful plot well delivered with dynamic characters with moving relationships and dialogue that evoke reader's empathy. This is an incredible historical romance! I loved both of the main characters, Emma Chambers and Patrick Garraty. They have both had a very hard childhood which has left them wanting a secure home and family. In reaction to his childhood Patrick made some very poor choices as an adult. Then when he hit a very low point he found God. Emma has drifted along life with her brother moving from place to place with no idea how to achieve her dream. At the beginning of the book they are thrust together out of necessity. The rest of the story is about their efforts to work together and build that family and home life that they are searching for. Before that can happen though Patrick has to face his past and learn the full meaning of God’s salvation and forgiveness. His journey to discover what that means is a wonderful reminder to all of us exactly what God’s grace and mercy is all about. Just started the series, a great read. I hope to read them all. The next in the story line is interesting as well. Thanks to the author for such an interesting story line. Emma Chambers has known a great deal of hardship and strife in her relatively short life, which has led her to long for a home and family to call her own. When a traveling minister approaches her with a suggestion that would give her all she’s ever wanted, she hesitantly agrees. But nothing has prepared her for being a wife and mother, and as the days go by, she wonders if she is equipped to be a good helper for Patrick. Not only that, but she is sure Patrick is hiding something from her. Will he ever feel close enough to her to tell her his secrets? 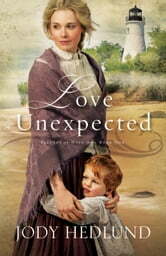 Love Unexpected was the first book I ever read by Jody Hedlund, but I absolutely loved it. While I didn’t expect it to be nearly that good, I was definitely glad for the surprise. With a hint of mystery and TONS of moments that will melt you right there in your chair, Love Unexpected deserves every one of the five bookshelves I am giving it. I cannot wait for the next one in the series!! I would recommend this book to anyone really, especially someone who loves a good happy ending.